It's All About the Journey... Did You Know There Is a CT Panhandle? Have you ever wondered why Connecticut's boxlike shape has a jut out into New York? In life we kind of like things orderly and symmetrical. I've recently learned the "tail" is called the Connecticut Panhandle. Texas, Florida and Oklahoma all have panhandles, but who knew Connecticut has one too! The Connecticut panhandle is the southwestern portion of Connecticut, where it abuts New York State. It is contained entirely in Fairfield County and includes all of Greenwich, Stamford, New Canaan, and Darien, as well as part of Norwalk and containing some of the most expensive residential real estate in the United States. 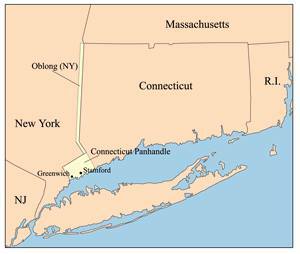 The irregularity in the boundary is the result of territorial disputes in the late 17th century, culminating with New York giving up its claim to this area, whose residents considered themselves part of Connecticut, in exchange for an equivalent area extending northwards from Ridgefield, Connecticut, to the Massachusetts border as well as an undisputed claim to Rye, New York. Just think Playland could have been ours. The two British colonies (a century before the future Revolution's end) negotiated an agreement on November 28, 1683, establishing the New Yorkâ€“Connecticut border as 20 miles east of the Hudson River, north to Massachusetts. The 61,660 acres east of the Byram River making up the Connecticut Panhandle were granted to Connecticut, in recognition of the wishes of the residents. In exchange, Rye was granted to New York, along with a 1.81-mile wide strip of land running north from Ridgefield to Massachusetts alongside the New York counties of Westchester, Putnam then Dutchess, known as the "Oblong". There is also a little cutout on the Connecticut - Massachusetts border known as either the "Granby Notch" or the "Southwick Jog" depending on which state you're in. After a 155 years of border disputes an agreement was reached over the final disputed 2.5 mile area - giving 5/8th's of the parcel around Congamond Lakes west shore to Massachusetts and Connecticut receiving the remaining east shore, creating the "Notch".